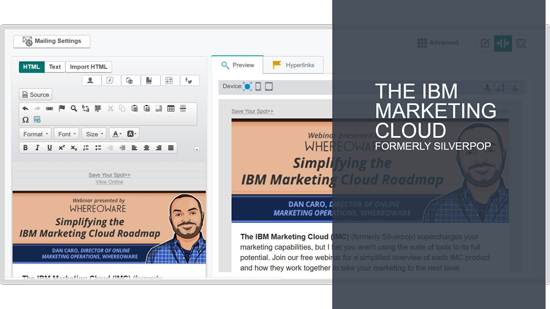 Dan Caro from Whereoware recently gave a webinar called “Simplifying the IBM Marketing Cloud Roadmap” explaining the changes and new IBM Marketing Cloud Roadmap. Below is a recap of the webinar walking through use cases for each tool. The IBM Marketing Cloud Roadmap can be confusing. Today, I’ll give you a quick overview of all the tools in the IBM Marketing Cloud and how you can use them to be a more effective marketer. Honestly, the hardest part of understanding the IMC is getting the names straight. This is partially due to the fact that the IMC means two things: it’s used as an umbrella term for the full suite of tools reviewed in this post; and it’s also the name of the marketing automation tool used for outbound marketing communications, formerly named Silverpop. In this article, when I say the IMC, I am referring to the tool that was formerly Silverpop. The IMC is a digital marketing automation platform that encapsulates email, SMS, mobile push, in-app messages, and social posts. My team at digital agency Whereoware uses it to create and execute behavior-driven, omni-channel campaigns for our clients. Program Blueprints is a new addition to the IMC helping marketers build programs faster with frameworks. There are currently 10 pre-built templates to choose from for popular email campaigns like Welcome, Nurture, or Abandoned Cart. If you have a mobile app, you need to take advantage of the IMC’s mobile push functionality. By integrating mobile push into IMC programs, you can send a timely, relevant push notification to your mobile app users. These push messages can be sent in coordination with email to enhance your outbound messaging strategy. Similarly, SMS messages are added to programs to let you text message contacts whose mobile phone numbers you have. This is particularly important if you are trying to engage your customers when they may be close to or in your brick and mortar location. Coming soon, Programs 2.0 will help you build multi-channel programs to automate your customer journeys using outbound messaging. Collaborate by sharing your multi-channel programs with your teams in a simple visual. Journey Designer is part of today’s IMC (formerly Silverpop). 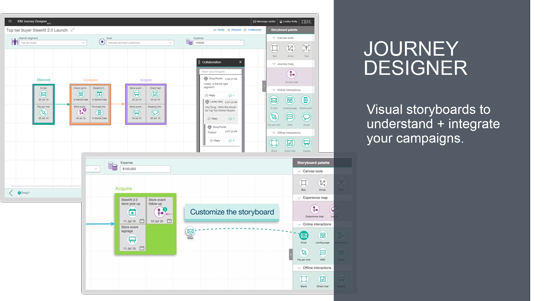 Journey Designer is a visual storyboard to help you understand + integrate your many marketing campaigns. Use it to collaborate with your team, schedule tasks, assign work requests, and measure overall campaign success. Digital Analytics lets you analyze behavior and results on your website to the individual-level and makes those insights immediately actionable. You can break down your visitors into groups, retarget them with outbound messages, measure the days it takes them to convert, and then analyze this data to optimize results. Tealeaf enables you to replay your customers’ real experiences on your website – review what pages they looked at and in which order, see what they typed into your webforms and see where they dropped off. These insights will help you course-correct any trouble areas on your site that are causing people to leave. Journey Analytics helps you visualize the customer journey on both the segment- and individual-level across all of your marketing channels. Journey Analytics can tell you how many customers you have in each journey stream, track the revenue per path, and also tell you what the most common and most effective journey paths are. At its most basic, UBX is a data highway passing behavioral data between channels and making that data immediately actionable in real-time. UBX allows you to set up integrations and access data from 70+ partners across the web in a couple of clicks, without needing IT involvement. Use UBX to create personalized retargeting campaigns in real-time, like session abandonment, cart abandonment, search abandonment, page visits, category visits, and more. Customer Experience Analytics combines Tealeaf, Digital Analytics, Journey Analytics, and UBX into a single dashboard. By combining the powers of all these analytical tools, you’ll understand who your customers are, what their journeys look like, where they are in the customer lifecycle, and more. Though I can’t promise the names or integrations won’t change again, today’s IMC tools help you monitor and make sense of your customers’ behaviors as they interact with your brand across channels. For more information and examples, check out our webinar recording below. If you’re interested in the cost, availability, and level of effort of each tool, get the summary graphic here. Dan Caro is director of Online marketing Operations at Whereoware, a digital agency with 16-plus years of experience building websites, crafting mobile applications, creating emails, and getting results with data integrations. They are the 2015 IBM Beacon Award winner and Silverpop’s Partner of the Year in 2011, 2013, 2014, and 2015.